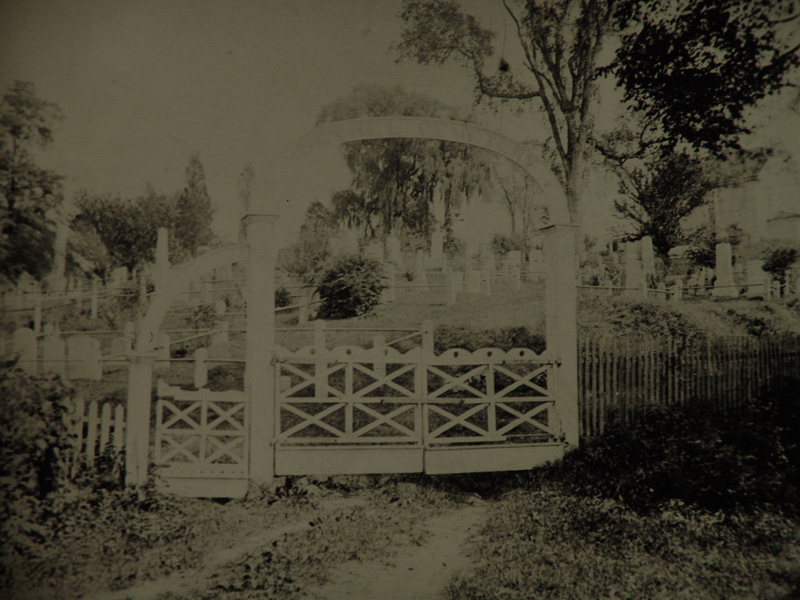 The gateway to Bethel Chapel and Cemetery, circa 1860-1870. This image has been manipulated in Photoshop to make it lighter. The unretouched image is below. This is the second in a series of rare 19th century images of Croton, selected from a collection that Croton filmmaker, journalist and history-buff Ken Sargeant photographed many years ago at the Ossining Historical Society. To see the first installment click here. Although you’d never guess it from looking at the driveway on Old Albany Post Road, during the time of the Civil War worshippers and mourners visiting Bethel Cemetery and Chapel would have entered the property through this quaint wooden gateway. The dirt road in the photograph follows the same path up the hill as the driveway does today and a number of the gravestones, particularly the two obelisks, are easily spotted. If you’d like to see the interior of the historic chapel2 you can attend Sunday service tomorrow, August 31, from 10 a.m. to 11 a.m.
For a fascinating look at the gravestones see The Graven Images of Bethel Cemetery by Carl Oechsner and Howie Meyers at the Croton Friends of History website. Coming next: A photograph of the tiny strip of land which once connected Croton Point to the mainland—long before landfill and the county dump altered the landscape forever. Detail adjusted to bring out the lettering on the wooden arch. 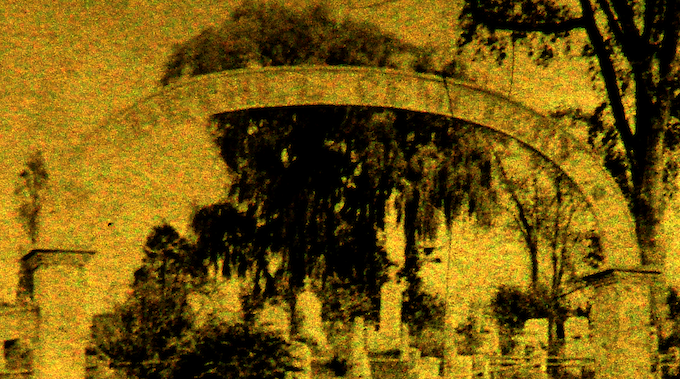 Unretouched image of the entrance gate to Bethel Cemetery. Although we have not seen the original photograph at the Ossining Historical Society, the image provided by Ken Sargeant appears to be a tintype, which enjoyed their widest use during the 1860s and 1870s. IT IS MARVELOUS WHAT PHOTOSHOP AND SENSITIVITY CAN DO!